With the help of our team of adroit professionals, we have become reliable names of an extensive assortment of SS Bar Tools With Cocktail Shaker . 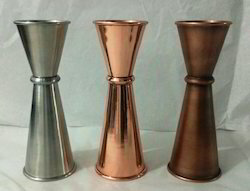 We offer this cocktail shaker at market leading rates. Designed from premium quality stainless steel our collection of bar tools and stainless steel bar accessories showcase the finesse in design and quality. With our bar tools it is possible to create your own bar at home with the same elegance and ambiance. They are extremely durable and are scratch resistant and hence look new even after years of usage. Offering a wide range of bar tools made from premium quality food grade steel. Designed with innovation, these stainless steel bar tools are offered with smooth surface and ultra sheen finish. We offer a wide range of high quality Bar Tool Set made from high grade stainless steel for strength and durability. 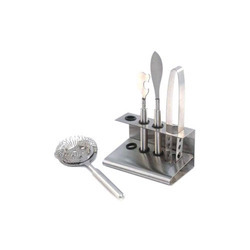 The set includes Bar Knife, Strainer, Double-Ended Bar Spoon, Lemon Zester, Ice Tongs and Stand. Bar Tool Set We offer high quality bar tool set. Our range complies with current trendy designs prevailing in market. These bar tool set curve are available in different styles and size. Accurately mark out, cut and made out of mild stainless steel, our range of cork opener are acknowledged for their finishing and pretentious designs. We specialize in making a wide range of stainless steel Round insert pan for 4 size and cover eache Size. These are available in various designs, shapes and sizes to suit the client’s requirements. We are secured into giving Bar Tool Set to our Clients. These have a soothing look, layout and are makes of worth material to make it last all the more besides open in unmistakable sizes. These are significantly asked for in the business area from our clients basically as a quality's consequence. The Product which we offer is to give party a specialist look.